Are Canadians Losing Faith in Harper's Economic Policies? Are Canadians Losing Faith in Harper’s Economic Policies? So far this election campaign is proving to be rather embarrassing for incumbent Prime Minister Stephen Harper. His own state agencies such as the Finance Ministry and Statistics Canada tells a different story than Harper is telling the Canadian people. Canada has officially entered a recession, according to Statistics Canada, that recorded the second consecutive negative gross domestic product, the very definition of a recession. Yet Prime Minister Harper is in denial, refusing the facts. Instead he tells us this. Have a look. CANADIAN PRIME MINISTER STEPHEN HARPER: The fact of the matter is over 80 percent of the Canadian economy has been growing. The Canadian economy as a whole is now growing, according to the June figures. So that is the reality. That is the reality of the situation. It is good news. PERIES: To discuss this and more we have two panelists joining us, Nora Loreto is the author of From Demonized to Organized: Building the New Union Movement. She’s also the editor of Rabble.ca’s series titled UP! Canadian Labor Rising. She joins us today from Toronto. David Moscrop is a doctoral fellow in the Department of Political Science at the University of British Columbia. He’s also a freelance writer published in many publications, including the National Post, the Globe and Mail, the Ottawa Citizen, and the Vancouver Sun. PERIES: So David, let me begin with you. We are now in the fifth consecutive month of a contracting economy according to Statistics Canada. Harper seems to be in denial about it in his campaign. Are these refutable facts? MOSCROP: Well, the fact that we’re in a recession is not refutable. I mean, everybody agrees that it’s a recession. The question is, how bad is the recession? It’s within the margin of error, essentially. It’s a very small downturn. But that says something broader about the economy, which is that the economy isn’t growing, and that’s the central point. Whether or not we’re in a recession is less important than the question of is the economy doing as well as it could, and clearly it’s not. PERIES: And Nora, give us a sense of what you think the issues are here when it comes to the contracting economy. LORETO: Well, Stephen Harper right out of the gate wanted to run this election on being the best economic manager from among the parties, to the point where the word ‘economy’ is actually on most of the election signs that his party is using. We have a campaign period that is double the length of time, which is not normal in Canada. And Harper had the ability to really frame how he wanted this campaign to unfold. I don’t think he accounted, though, for some of the hiccups that have arisen throughout the course of the last few weeks. And one of those hiccups of course is the news that the economy is restricting. It wasn’t a surprise to nearly anyone, and certainly it’s not a surprise to Canadians who are feeling the effect of an economy that’s slowing down. But for a prime minister who wants people to elect him based on an economic record this becomes a very major political issue for him to contend with, and has become a central issue within the campaign. In fact, up until the last couple of days the economy was probably, and the deficit and the recession, were probably the biggest campaign issues that the candidates were trying to manage. Of course, everything’s changed now that the focus has turned to the refugee crisis in Europe. But it’s bad news for a prime minister who wants to take credit for when the economy is growing and doing well, and who doesn’t want to take credit for when the economy is contracting and not doing as well. PERIES: Now, one would argue that there is a global trend downward. Stock markets really crashed, the past week has been in a significant dive, as far as the stock market is concerned. On top of that we have very, very low oil prices that Canada depends on. As well, oil has been the lowest it’s been in years now. So David, let me go to you. 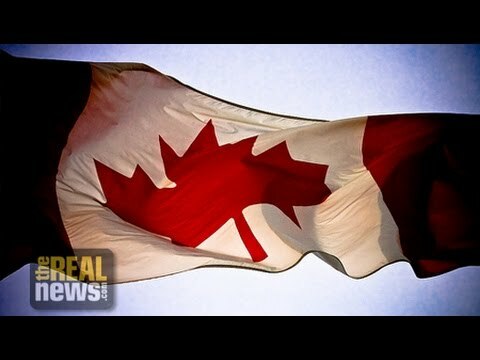 Do you think the global recession has something to do with what’s going on in Canada? MOSCROP: I mean, it certainly does. The price of oil has a huge impact on the strength of the Canadian economy. Let’s be honest, the same way that the president of the United States can’t control prices of gas, the gas prices, the Canadian prime minister can’t control the price of oil or the price of almost any global commodity, really. Canada’s a fairly small economy. That said, we can ask the question, well then, why is 80 percent of the economy reliant on 20 percent of energy exports? Why, essentially, can 20 percent of the economy hold 80 percent of the economy hostage, which is what’s happening with energy prices? Why hasn’t the Canadian economy diversified? We had an opportunity to do that in 2008. We could have structurally started to shift the focus of the Canadian economy away from traditional energy. We haven’t done that. So in a sense the prime minister isn’t on the hook for the recession itself, because you can’t control the price of oil, he can’t control the Chinese economy, he can’t control the Iran deal. But he is on the hook for failing to diversify the Canadian economy when he had a chance. And so this is why, I think, the question of whether or not we’re in a recession, while interesting for political purposes, isn’t as important as the broader questions about, you know, how has this guy and his party managed the economy? Why has he chosen this path instead of another, and is this the same sort of government we want going forward? A lot of Canadians are starting to question that. You’ve seen some movement on trust in the Conservative party around the economy. It’s starting to shift to the Liberal party and the New Democratic party, which is a real concern for the Conservatives, who were traditionally seen as good economic managers. PERIES: So David, give us a sense of what you think requires to be on an economic plan to diversify the economy? MOSCROP: Well, you’d be better off asking a true economist about that. But I can tell you about the politics of the dedication of the Conservative party to traditional means. I mean, they get a lot of votes in the West. They’re after a lot of votes in Alberta, which is oil country. That hasn’t worked. I mean, the Dutch disease has been thrown around quite a bit, whether or not Canada is susceptible to Dutch disease or whether or not we are suffering from Dutch disease is a debate we can have. But the question is are we too reliant on the energy economy? And it seems to be the case that we are. Now, we’re lucky that we can pivot a little bit to the manufacturing sector when things get bad, and that’s what happened. In fact, the manufacturing sector is ticking up. But the question is, do we want to keep doing this dance going forward, that oil goes down, manufacturing goes up. Manufacturing goes down, oil goes up. Or do we want to start talking about, say, things like renewables? Do we want to start to try to become a leader in renewable energy? Do we want to start to become a leader in R&D and innovation? That’s a political question as much as an economic one. Politically I think it’s quite sound in the long run. It’s good for the country, if also a little bit tricky, because you’ve got to be able to sell that to people. And that requires people investing and shifting, and giving a little something up. I don’t think it’s likely, because of the electoral politics of the country. But in the long term I do think it’s necessary. PERIES: So Nora, in the past you’ve spoken quite eloquently about a more progressive economic platform that really stimulates the economy and increases employment. Give us a sense of what you would be looking for on a campaign platform. LORETO: We’ve already heard from the Liberals, of course the centrist party, and the NDP, which is kind of center-left, that they would invest heavily in infrastructure spending. The Liberals going so far as to admit that they would run deficits for the first three years to finance the infrastructure spending. And a lot of that would be put towards sustainable infrastructure, public transit, and some of the sustainable projects that we really haven’t seen much from the Conservative government. But it’s also I think interesting to look at how has the Harper government treated the public sector, which is of course also part of the engine of economic growth in Canada. This morning Statistics Canada released their labor force survey and 95 percent of the jobs that have been created in the last period have been in the public sector. Which is pretty interesting when we consider the attack that has been waged on the public sector by Harper and his government, but also provincial governments across Canada, too. And so when we talk about economic growth and economic strength, there’s also the whole element, the whole human aspect to it. And is it how are people doing, how are people getting by. Canadian households are apparently more wealthy but at the same time they’re borrowing 160 percent of their income, which is the highest amount that Canadian families have been borrowing ever. And that’s an average. So there’s a lot of people that are obviously surpassing that. There’s a real disconnect between what the Conservatives consider to be average and what I think that the numbers consider to be average. We heard this week that the Conservatives consider an average income, an average family income, to be somewhere in the range of $125,000 a year. All you have to do is a quick Statistics Canada search to see that Statistics Canada, when posed a similar question, the median income is more like $76,000. Of course the median helps to account for the large outlying incomes. And so when we hear promises from Stephen Harper, especially promises targeting who he considers to be average, what we really need to do is ask, are these people average? Is this guy speaking to me, or has he actually got a distorted view of what average is? Considering the bulk of his support is going to come from Ontario, and more specifically Southwestern Ontario and the greater Toronto area, that’s actually–it’s very significant, because he’s talking to people who are mostly in the suburbs, who are mostly commuters. There’s still a strong progressive Conservative base of voters who haven’t perhaps figured out how just far extreme right this party has gone. And so what kind of political tricks are we hearing when Harper positions himself as talking about the average? And I think that it doesn’t take too much to see that in fact it’s quite a distortion from the average. PERIES: And David, what are the kinds of things you would be looking in for a platform? Now, there is a Canadian election debate coming up, where the economy is going to be the primary focus. So what are the kinds of things you would look for, when–you earlier said that this government has not been very effective at diversifying the economy. What kind of things would you like to then see in the upcoming election platform? MOSCROP: Well, I would focus on three things. Nora pointed to infrastructure. I think infrastructure’s remarkably important. I mean, I live in Vancouver, British Columbia. We just had a disastrous experiment in transit funding, a referendum that failed. Now we’re in the lurch, we’ve got no plan for transportation and a city that’s going to grow by about a million people in the next few decades. So you know, what are you going to do about that? I think the Liberals have been in a lot of ways most sensible on this, and in some senses left of the New Democrats, who are traditionally more left, admitting that this is going to require some spending. And it’s good spending because it’s essentially an investment in infrastructure. It’s not a deficit you’re going to have to run over and over and over again, despite what the Prime Minister wants to sell to Canadians. He says the Liberals will have to run structural deficits, but they won’t. The second thing is R&D. Canada is a really laggard, globally, in R&D. It’s actually quite embarrassing. There’s several firms that seem to be driving it. And so the economy is in a sense held hostage by the R&D of these companies. So we need to do better at funding research and development. We can’t have companies, corporations, sitting on large amounts of wealth or refusing to invest in the economy. I think that’s quite important, too. And the third thing is going to be, how are you going to fund post-secondary education and healthcare? These things have been in large part ignored during the campaign so far. And yet they’re significant. I mean, these are investments in human beings, investments in the long-term health and wellbeing of Canadians, an investment of the intellectual capacity of Canadians, which is going to be important going forward for developing a contemporary, a modern economy, which in some ways we’re not. I mean, if you look at the economic model that Canada’s using, I mean, it wouldn’t be so shocking to someone from the 19th century, from the 18th century, looking at what is essentially a manufacturing and energy economy. We’ve fallen behind. And so the question is, what are you going to do going forward about that? PERIES: And Nora, David raises some very good issues here. Your reaction to it? LORETO: Yeah, there’s really no question about the need to hear where the parties are on those social service issues. Every time that social services like healthcare or education have been mentioned in this election the Conservative kind of cheerleading team has been very quick to jump on people online to remind them about the difficulties within Canada’s constitution to fund healthcare and education. Because those, broadly speaking, are responsibilities for the province. Of course though, it is possible. The Canada Health Accord has run out under Stephen Harper. He has announced that he intends to start reducing transfer payments in two years. And there’s been some promises made by the NDP and the Liberals, but they’re not quite clear. Because of the strangeness of this campaign a lot of people anticipated that at least it would start now. I think a lot of people didn’t anticipate that there was going to be so much interest, actually, from average people before the summer was through. And so there’s a lot of holes in the platform. There’s been no platform released that’s fully [costed]. And so knowing or anticipating what the other parties are going to be promising by way of higher education or healthcare, it leaves us in a little bit in a guessing space. But for me, I come from the student movement. And seeing the attack that has been waged on higher education across Canada is pretty stark. Student debt now in Canada can reach $24 billion. There was a ceiling that was raised by the federal government, done very quietly last May. That $24 billion only represents 40 percent of potentially held student debt. So there’s another 60 percent of that proportion on top of that $24 billion held at the provincial level. And as was said, research and development has been completely divested. Most provincial governments have fundamentally changed how they fund research. And so corporations have been disincentivized to fund research. They have all moved in to the universities under the guise of commercialization. And the universities have basically taken on private sector research and development without actually having the mechanisms necessary to then create the economic opportunities that a corporation would. When you look at the role the federal government has played in that, research has been under attack. The tri-granting councils have been fundamentally changed. The Social Sciences and Humanities Research Council, for example, had its money changed to try and chase business research. Like, just, just ideas that are ideologically driven that are not actually what Canadians need. And there’s a lot of potential for the NDP and the Liberals to make up some serious ground in their promises. And so I’m really looking forward to see what comes from that. PERIES: Nora, leading up to the debate we’re going to be covering this issue a lot more. So I hope both you and David Moscrop, you can join us again for a discussion prior to the 17th debate. MOSCROP: I’d be happy to. Nora Loreto is the author of From Demonized to Organized: Building the New Union Movement. She is also the editor of Rabble.ca’s series titled UP! Canadian Labor Rising, and joins us today en-route to Toronto.